Lot Size: 1296 sq. m. n/a "Dimensions: 40 x 30"
Ocean front opportunity!! Affordable beach living in this 3 bedroom 3 bath 1,900 sf townhome. 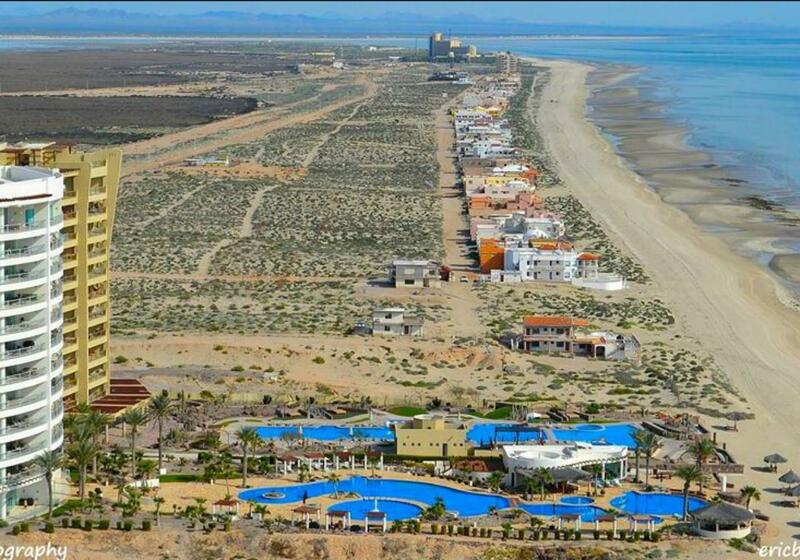 Playa Miramar, acknowledged as one of the finest beaches in all of Rocky Point, is a gated and quiet beach front community east of Puerto Penasco. This 2 story has one bedroom down and 2 master suites on the 2nd floor. Each suite has a fireplace with balcony and great views. There is travertine tile throughout the house. Kitchen opens to the living room which provides for a direct walkout to the beach. The property is walled and gated and includes a detached garage. Enter the house through a gate and courtyard for privacy. There is 1 other townhouse condo also available. Bank trust in place with AZ LLC for low buyer closing costs. Grand Mayan Resort and J. Nicklaus golf course just a mile away.